Panel discussion kicks off WORLDPAC's first supplier and training expo. ORLANDO — There’s a lot that goes into that oil that you’re using in today’s vehicles long before you pour it into an engine in they shop. Five oil company leaders told those who use their oils on a daily basis just what goes into being factory-approved as well as staying ahead of oil technologies during WORLDPAC’s oil panel at its first supplier training and expo Friday in Orlando. It’s a careful balance for oil companies to manage their offerings to meet not only what the carmakers look for, but also what the engines need to stay on the road, says Cameron Evans, director of sales and marketing for Red Line Synthetic Oil Corp. It also really revolves around factory approval.
. . . Steve Matsumura, engineer Lubricants Division with Nippon Oil/ENEOS, says it also comes down to three main things when garnering factory approval: technology, global supply capability and cost. Dave Wolman, president of Motul USA, expands on that, saying the relationship between the oil company and the factory also is a key component. That’s especially important because Wolman [Motul USA] adds that most endorsed engine test results last only about five years. And even before the oil can be considered as meeting these tough oil requirements, what goes into the liquid is carefully studied and planned. Evans says its starts with the base stocks. The hardest part, he suggests, is that some of this information is not well described in the industry. Technicians end up basing decisions on who is willing to talk and companies’ integrity.
. . . And these shop owners and technicians know what they’re looking for in the end. Jim Phillips, vice president of marketing for WORLDPAC, kicked off the panel discussion by telling attendees that even though the oil change is one of the most common services they perform, across the board they’re not the majority. Independent repair shops perform only 14.4 percent of oil changes in today’s aftermarket. The majority, according to statistics Philips reported, belongs to quick lubes, 24.5 percent, and new car dealerships, 24.4 percent. 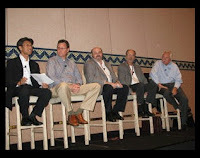 Oil panelists incledued Steve Matsumura, Nippon Oil/ENEOS; Cameron Evans, Red line Synthetic Oil; Dave Wolman, Motul USA; Abe Garweg, CRP/Pentosin; and Gary Boyd, Liqui-Moly USA. WORLDPAC’s Supplier & Training EXPO provided guests with a completely customized weekend of exclusive technical and business training specifically designed to increase the future success of their independent repair business. The event hosted over 500 import specialists from 43 US states and Canada, over 50 leading suppliers including tool and equipment manufacturers and over 30 of the industry’s most respected training instructors.